There is “no possibility” that U.S. President-elect Donald Trump can change Iran’s nuclear deal with world powers, Iran’s president said on Nov. 9. 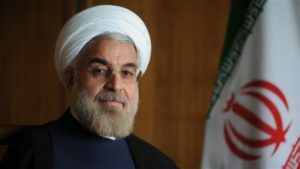 “Iran’s understanding in the nuclear deal was that the accord was not concluded with one country or government but was approved by a resolution of the UN Security Council and there is no possibility that it can be changed by a single government,” President Hassan Rouhani was quoted by AFP as having told his cabinet. During the election campaign, Trump described the deal as “disastrous” and said dismantling it would be one of his top priorities. Ali Akbar Salehi, head of Iran’s Atomic Energy Organization, said in September that the nuclear deal will not be in danger should Trump win the White House. “I don’t think (the nuclear deal would receive) any serious impact (from Trump). It may go a little bit up and down, it may delay certain things, but it will not seriously detract (from the deal),” Salehi said. Similarly, Iranian Foreign Minister Mohammad Javad Zarif in June said the nuclear deal can’t be renegotiated despite Trump’s pledge to do so.